Findouters Challenge: Book 2. 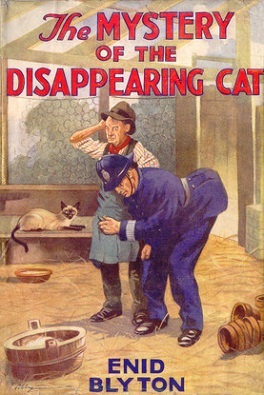 This second book is set some months after the first and is the first of the two “cat” titled findouters books. Bets is excited at Pip, Larry and Daisy coming home after three months away at school. In the meantime, Pip has received a letter from Fatty saying that his parents like Peterswood so much that they’ve bought a house there, so the Findouters will be together again. Pip and the others return to find that the Hiltons have a new neighbour, Lady Candling who happens to have a set of prize-winning Siamese cats, among them Dark Queen who has some distinctive white hairs in her tail, and has won £100 recently. Interested in seeing them, the children make friends with the gardener’s boy, fifteen-year-old Luke, who is slow at some things but deft with his hands, tending the garden and carving whistles and model cats for the children, particularly little Bets. His “boss” Mr Tuppings the gardener, however, is a nasty piece of goods, ill-tempered and always out to make poor Luke miserable. When Dark Queen goes missing, Luke who has been working around the cat cages at the time, is the prime suspect, circumstances pointing to him, and it is only the children who believe he is innocent. They set out to solve the mystery and along the way, end up playing some tricks on poor Mr Goon whose ankles are once again Buster’s target. This was one of the more creative of the findouters mysteries where the “how” was great fun, much more interesting than book 1 (which wasn’t all that straightforward either). I remembered part of the plot but not all of it, and also not the twists along the way. Once again it is young Bets who catches on to the important clues and while the others are slower to see their significance, Fatty ultimately works it out. Inspector Jenks is also quite happy to come to their aid when they aren’t sure what course to adopt. On the “food meter”, this one still ranks low, the kids eating a little but still not making any trips to the tea shop or eating ices with Inspector Jenks. My impression of all that food must come from the later books. I’m enjoying reading these in order and seeing how the stories developed overall. The food element for one seems to have come in much later. Also, we haven’t yet “met” all the children’s families, only the Hiltons so far and the Findouters haven’t begun using Fatty’s shed. Now on to the next one to see how things go. What fun this is! I don’t remember this one at all; The pantomime cat is more familiar. Will re-read and then get back to you. Do- its all Siamese cats. I remembered the solution but not all of it so it was fun reading again.